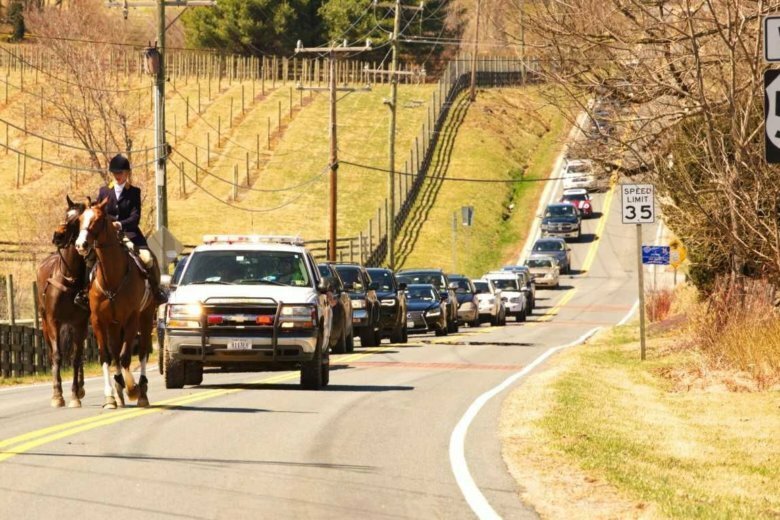 It’s not something you see everyday, even in Virginia’s horse country — a riderless steeplechase horse, galloping full speed down a crowded Route 50 in Fauquier County, with two mounted huntsmen giving chase. What started as a day of steeplechase at Salem Farm, just east of Upperville, Virginia, quickly turned into a heart-stopping, odd, dangerously wacky attempt to save the life of a valuable horse, and avoid dangers to nearby people. Betsy Burke Parker, a reporter with the Fauquier Times, was covering the first race of Saturday’s Piedmont Foxhounds Point-to-Point. An Irish-bred horse named Some Response, in his first race in the U.S., tossed his rider after hitting a fence. After following the other horses for a short while, Parker said the horse careened toward a fence, along Route 50. Just less than a mile from where Some Response jumped over the fence is the picturesque unincorporated town of Upperville, population 793. With beautiful weekend weather, Parker said the runaway horse was both a danger and in danger. “The only thing that could catch him safely was another mounted rider,” she said. A nearby huntsman on horseback let himself out of a nearby farm gate. “Jordan Hicks took off in hot pursuit down the highway,” Parker said. His assistant, Lissa Green, followed. Hicks and Green said Some Response finally stopped sprinting near the Hunter’s Head Tavern, where he was easily captured. After making sure he was unhurt, from atop her horse, Green led Some Response back up Route 50 toward Salem Farm. “Lissa Green was ponying her horse on her right, as is normal, trotting down the middle of the road,” Parker said, followed by a sheriff’s deputy, and dozens of cars, patiently traveling behind the first responder in the single eastbound lane. Route 50 in Virginia has a variety of lane configurations and surroundings, as it stretches 86 miles from Rosslyn to West Virginia, including through horse country. WTOP’s Neal Augenstein reported from Upperville, Virginia.